So you’re pregnant and you can finally eat for two – or can you? It’s common for some women to view pregnancy as a time to relax any previous ‘diets’ they’ve followed and indulge. After all, you’re going to get bigger anyway right? In actual fact pregnancy is a great time to really focus on ensuring you’re eating sensibly for both your and your baby’s benefit and it can lay the groundwork for a healthy future. Whether or not you develop gestational diabetes (GDM), weight gain in pregnancy is an important topic. So I should eat for 2 now, right? It’s untrue that you should eat double when you’re pregnant. Your body does have increased energy requirements however it’s more the increase in nutrients that really matters. So diet quality is the key, not quantity. The additional quantity is minimal in terms of actual extra energy needed. Per day it might look like the equivalent of two pieces of bread, a glass of low fat milk and an apple, and this amount extra is only for the last trimester! As is the case outside of pregnancy, everyone’s body is different and there will always be people who can eat more and not gain as much weight and those who are very careful and still seem to put on more weight than they expect. You can only do your best. Why does weight gain matter? 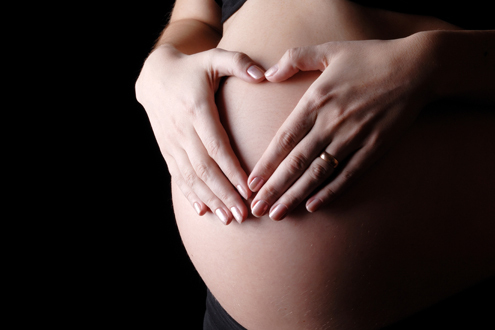 Excess weight gain can impact negatively on the pregnancy. There’s a higher risk of blood pressure problems, gestational diabetes and problems at delivery requiring intervention when weight gain is too high. Some studies also link high weight gain in pregnancy with increased risk of miscarriage, stillbirth and congenital abnormalities in the baby. Childhood weight problems are also increased. It’s also less likely that you will return to your pre-pregnancy weight if you gain higher than the recommended amount of weight. Where does all the weight go? It’s expected that you’ll gain weight in pregnancy. There are many components to this. Your blood volume doubles, your uterus increases in size as does your breast tissue. In addition to this there is the weight of the baby (or babies), amniotic fluid and additional fat deposits to assist with both carrying and then breastfeeding your baby. These components add up to around 13kg (28 lb). Should I get weighed throughout my pregnancy? In the past it has been unfavourable to weigh women when they are pregnant and certainly some doctors don’t want to step into what may be seen as an emotional area. This may be particularly problematic for women who start the pregnancy overweight, as they are more likely to gain an excessive amount of weight. These days the value of weighing women through pregnancy is being seen and more doctors are again starting to track weight gain at each visit. My doctor says I’ve put on an average amount of weight. Haven’t I? There is a difference between what may be ‘average’ and what is recommended. Just because your colleague or sister gained 20kg (44 lb) doesn’t mean it’s the right thing for you. Unfortunately many women are not aware of what amount of weight they should be gaining which can make monitoring weight gain of limited usefulness. So what is the right amount of weight to gain? The official guidelines have recently changed. This is because in the past one of the main concerns was that women were at risk of undernutrition whereas these days our generally abundant food supply puts us in a situation of potential overnutrition. However many experts feel these guidelines are still well above necessary and favour the levels found in other studies that have indicated a significantly lower amount of weight gain is justified. For this reason you may find variation in that which is recommended. Speak to your health care provider for more information on this. Below is a guide of the two main schools of thought on the subject with the likely best guide probably lying somewhere in between and reflected in the column, ‘Suggested composite weight gain’. Please note that the measurement used here is your Body Mass Index (BMI). BMI is a measure of your weight related to your height. You can find an online imperial and metric BMI calculator here if you are interested. Comparison of Weight Gain Guidelines for Pregnancy by The IOM (Institute of Medicine) & Cedegren: MD, PhD. In first trimester weight gain should not be greater than 2kg/ 4.5 lbs. This means taking care with managing any nausea (not too many salt and vinegar crisps) is paramount. It can also be hard to maintain activity levels with the early pregnancy exhaustion. Getting back into a routine or commencing a more realistic activity plan for pregnancy can be useful. The aim in pregnancy is not to ‘diet’ or intentionally lose weight. Instead think quality. Try to keep track of the amount of each of the food groups you need to consume each day and plan your meals and snacks so that your diet is well balanced (see our Pregnancy Nutrition section). The occasional ‘treat’ is usually okay but be careful about how often these foods creep in. Commonly it’s the extra cakes, high carb drinks such as juices, frappes and shakes, chips and take-away that lead to excessive weight gain (as well as overdoing it with large portion sizes.) Snacking too often on these foods also means you’re missing out on the more nutritious foods that you and your baby really need. What about weight gain if I have GDM? The weight gain guidelines are no different. Unfortunately many women have gained too much weight by the time they are diagnosed around weeks 24 – 28. Simply altering the diet to follow the GDM guidelines usually ensures that excess gain is avoided. Women with GDM often find that by cutting out the cakes, juice, large bowls of cereal, take-away, they lose weight initially, and certainly some women may find their weight stabilises. This is not of concern to the baby so long as you’re still eating enough. It’s really important not to starve yourself in pregnancy and to make sure you’re still eating enough of all the different food groups in appropriate amounts. Undereating can be harmful to your baby and not great for you either. Be sensible and focus on the food quality and amounts and don’t react to the number on the scales. It can help to see a dietitian in both early and later pregnancy to work out a plan that works best for you. Furthermore, breastfeeding means your baby continues to rely on you for a healthy intake but we’ll cover that in a later article. I have an interesting perspective on weight gain in pregnancy. I was diagnosed with GDM during my first pregnancy. During the whole pregnancy I gained 6kg (from 47 to 53kg) and my healthy baby boy was 3.44kg(7pound 9oz). I was a bit worried about such a small weight gain, but my obstetrician was not! So you can certainly have a healthy pregnancy and healthy baby with a small weight gain!